At Athina Hotel Kefalonia in Krestena Ancient Olympia, you can enjoy a pleasant stay. The hotel is located just 5 minutes from the beach, in a lush landscape. You can choose to visit many archaeological destinations or the unique natural beautiful landscapes in the wider region. The 3-star Hotel Athina Beach in Sami is highly recommended for a beach holiday. The hotel is the ideal accommodation choice for holidaymakers who would like to use enjoy the beautiful beaches on Kefalonia. The cave of Melissani can be found in the immediate vicinity of the hotel. Popular excursions include Antisamos Beach, Lourdas Beach (Lourdata) and Argostoli Archaeological Museum. If you wish to bring your pet, please discuss this directly with the hotel. 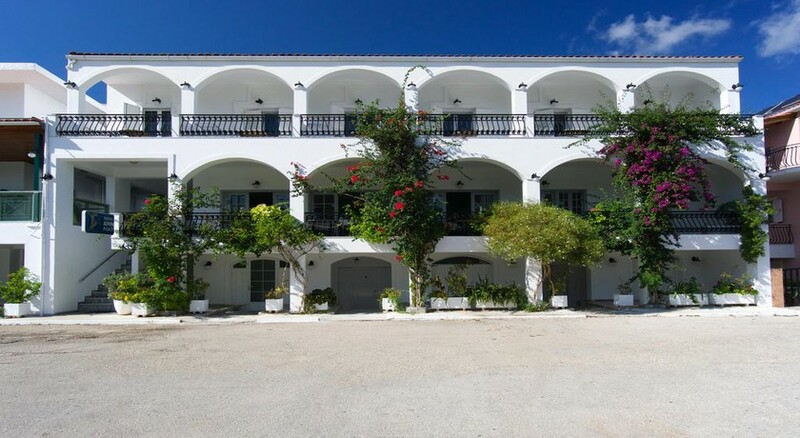 The complex is located in the village of Karavomylos, on the bay of Sami, in one of the most beautiful areas of the eastern part of the island of Kefalonia. The tourist center of Sami is about 2 km away. The beach is about 200 meters from the hotel while the city center is about 1 kilometre from the hotel. 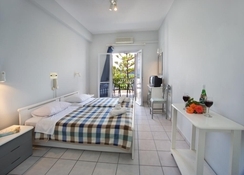 Athina Hotel Kefalonia offers a total of 45 rooms for its guests. Accommodation options include Double Rooms, Triple Rooms, Double Bed Studios and apartments. The studios and apartments of this air-conditioned apartment hotel make you feel right at home. A safe, currency exchange facility, a TV room and room service are provided to guests of the accommodation. Wi-Fi provides travellers with access to the Internet. If you arrive by car, you can park it in the hotel car park.The rooms are equipped with a kitchen and a bathroom, air conditioning is provided for the right room climate. The standard furnishings in most rooms include a balcony that invites you to linger. Start your day with a rich breakfast. Athina Hotel Kefalonia offers a delicious buffet in the morning, where you can help yourself to a drink or a day on the beach. The hotel has a café with indoor and outdoor seating. Enjoy a hot cuppa in a tranquil ambience at the cafe. Enjoy a variety of enticing cocktails and spirits amidst a cosy atmosphere at the bar. Athina Hotel Kefalonia offers various entertainment options. 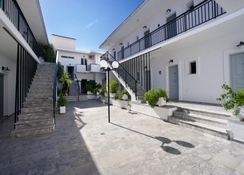 The hotel offers facilitates sport with its tennis court, volleyball court and basketball court. Alternatively, you have the opportunity to discover the most beautiful corners of the island while sightseeing. The hotel offers necessary services like Fax / Photocopying / Printing Facilities, Currency Exchange, Safety Deposit Box and much more.